"It is as though in pure frustration, they turn themselves inside out in a desperate attempt to capture the bacteria they have not been able to overcome. Using this approach, they capture a number of bacteria at once in net-like structures, or neutrophil extracellular traps (NETs). This works very well in many places in the body, where the NETs containing the captured bacteria can be transported in the blood and then neutralised in the liver or spleen, for example. However, in the case of bacterial meningitis, these NETs get caught in the cerebrospinal space, and the cleaning station there is not very effective," explains Adam Linder, associate professor at Lund University and specialist in Infectious Diseases at Skåne University Hospital. 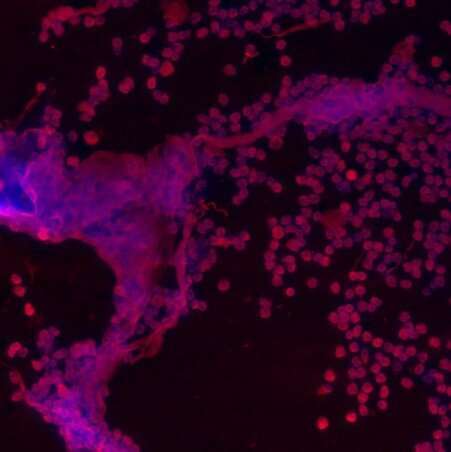 By using advanced microscopy, the researchers observed that the cerebrospinal fluid of patients with bacterial meningitis was cloudy and full of lumps, which proved to be NETs. However, among patients with viral meningitis, the cerebrospinal fluid was free from NETs. When captured bacteria are caught in the cerebrospinal fluid, it adversely affects the immune system's work of clearing away bacteria and also impedes standard antibiotics from getting at the bacteria, says Adam Linder. "We gave DNase to rats infected with pneumococcus bacteria, which causes bacterial meningitis, and show that the NETs dissolved and the bacteria disappeared. It seems that when we cut up the NETs, the bacteria are exposed to the immune system, which finds it easier to combat the bacteria single-handed. We were able to facilitate a significant reduction in the number of bacteria without antibiotic intervention," says Tirthankar Mohanty, one of the researchers behind the study. "At that time, everyone was so happy about the antibiotics—they reduced mortality for the infections, and it was thought that we had won the war against bacteria. I believe we need to go back and take up a part of the research that took place around the time of the breakthrough for antibiotics. We can, perhaps, learn from some of the discoveries that were then flushed down the drain," says Adam Linder. "The development of resistance in bacteria is accelerating, and we need alternatives to antibiotics. The drug we used in the studies is a therapeutic biological product derived from humans and has already been approved for human use. They are not expensive, and have also been tested against many different bacteria and infections. Bacterial meningitis is a major challenge in many parts of the world. In India, for example, it is a major cause of death among children, so there would be significant benefits there from using such a treatment strategy," says Tirthankar Mohanty. The researchers want to set up a major international clinical study and use DNase in the treatment of patients with bacterial meningitis.